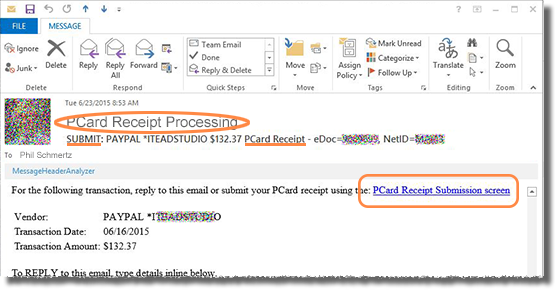 Every time you use your PCard, you'll receive an email notification from PCard Receipt Processing with a subject line that begins SUBMIT and includes the words PCard Receipt. 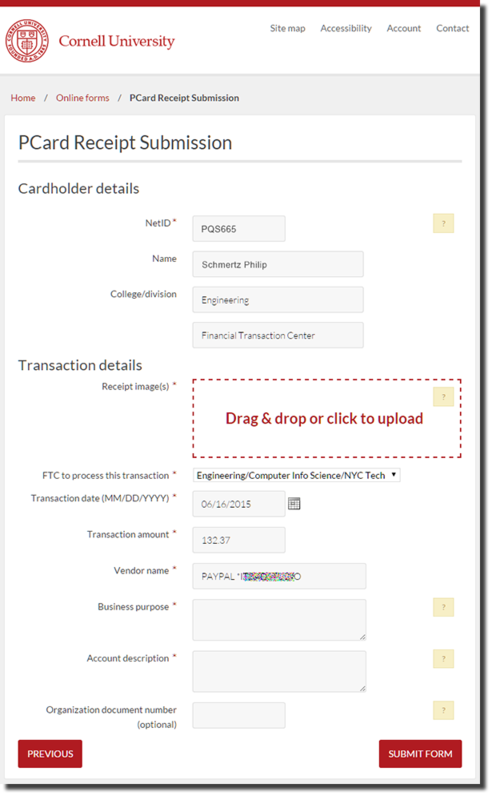 Click the PCard Receipt Submission screen link in the first link of your notification email to go to the form. You may be asked to authenticate with your NetID and password. You'll see that the form already has the information contained in your email notification. click anywhere in the dashed red rectangle, navigate to the receipt file, then click Open. Complete the remaining fields on the form, them click SUBMIT FORM. If you have a paper receipt, you need to scan it, using one of the formats listed here, or take a photo of it. Most phones take JPG photos, which is fine. print it and take a photo of it. print it and scan it. talk to your local technical support to add "print to PDF" to your computer's list of printers. This allows you to use the same method you use to print, but directs your computer to produce a PDF file instead of a paper copy. You can then attach the PDF to your reply.